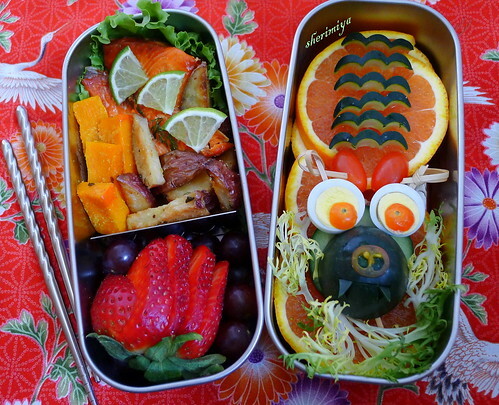 Chinese New Year Dragon Bento, a photo by sherimiya ♥ on Flickr. Aaaand, it's another Chinese New Year bento! It's the Year of the Dragon - in case you forgot. Today I used my super cool slim stainless steel double box bento set (called "Zen" from Bento & Co) because I wanted to have a place for my dragon to rest until lunchtime. Each of these boxes is identical, and each has its own lid with gasket. When the two tiers are stacked and bound together with elastic, they are perfectly sealed. The left box contains salt grilled salmon with some lime wedges, roasted potatoes and kabocha strips (both sprinkled with garlic powder), and a bunch of grapes with a beautiful strawberry. The right box is layered with slices of cara cara oranges. I am super excited to see these fruit too! Now I am stocked up on blood and cara cara. They complement each other well -- the dark red blood oranges are tart and the pretty pink cara cara are sweeter. On top of those I lay my dragon made from cucumber, with quail egg and tomato eyes, tomato nostrils, and wispy green fire. I also cut some fierce fangs from the cucumber. His body is represented by the cucumber scales behind his head. Do you see him? I am trusting MisterMan with both tiers of this bento set for the first time, and I'm a little nervous! I hope he doesn't fling his bag around too much. RAWR! Added to Allergy-Friendly Lunchbox Love. So cute! 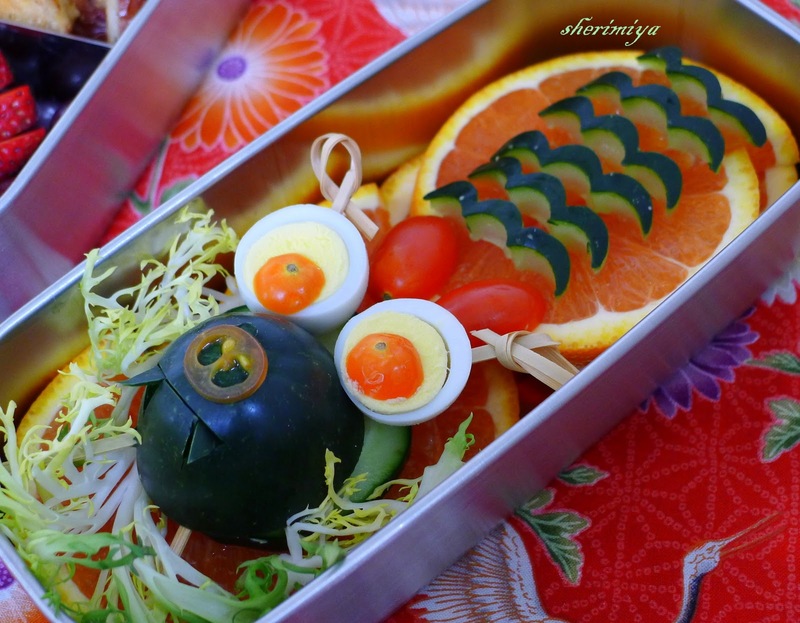 I need lots of good inspiration because I cannot forget to make a dragon bento on Monday. Kidlet would never forgive me since he was born in the year of the dragon! So he'll be 12 this year - wow time flies! Can't wait to see your dragon Jenn! Looks like some of the wild boars out here. Well... maybe. Wonderfully creative though. You're amazing! Waitaminit.... you calling this dragon a boar? You have wild boar? Eek. This dragon looks way fiercer than yesterday's one ! Very cool idea to use the cucumber for the scales, it's what immediately caught my attention. Whoooa Awwesome! Sheri this dragon won't be messed with at all...hands down, fiercest dragon of the New Year!!! Perfect! I love the way the curly skewers serve both a purpose and make wonderful ears. Thanks a lot KidsDreamWork, Ceinwyn, Rina, berrygirl and Blorgie! Amazing! Wonderful job! I pinned it! My jaw just dropped down when I saw it! WOW! This is a great bento. I like how you made dragon's face. Very creative and amazing work! Thank you Nami; so sweet of you! This dragon was fun to create! Amazing!!! Your creativity knows no limits!! crazy cool! such a great use of some unique supplies (like the bamboo picks). Thanks so much Mrs. P! That has to be the most gorgeous bento I've ever laid eyes on. You are an artist. I can see that my post will be late today as I browse through the rest of your delightful blog. You are too kind. Your sweet comment just made my day! Thank you!